(b ca. 1530 in Valenciennes, d late September 1600 in Paris). Claude Le Jeune, also Claudin le jeune, was an influential French- Flemish composer. The first record of his musical activity is from 1552 (four of his chansons were published at Leuven, in anthologies). In 1564 he moved to Paris. In 1570 Le Jeune began his association with the Academie de musique et de poésie, headed by Jean-Antoine de Baïf, an association which was to be decisive both on Le Jeune's music and on the direction taken by the Academie. That Baïf was a Catholic, even an apolegetic one, appears not to have dissuaded Le Jeune, who did not hide he had Evangelical (Huguenot) sympathies) from working with him. When in 1589 Le Jeune was found out to be the author of an anti-Catholic tract he had to flee Paris during the siege that year: only the intervention of his friend, the composer Jacques Mauduit, saved his life and prevented the destruction of the manuscripts he carried with him (according to Marin Mersenne, who wrote extensively about both composers in his Harmonie universelle of 1637). Next, Le Jeune settled in La Rochelle, a stronghold of the Huguenots, but sometime in the mid-1590s he must have returned to Paris, for his name appears in a list of musicians of the royal household of Henry IV both in 1596 and 1600. Few other details from late in his life are known, but he must have been composing prolifically, judging by the enormous quantity of music which remained in manuscript at his death, most of which was published in the first two decades of the 17th century. He died in Paris, and is buried in the Protestant cemetery of La Trinité. After 1570, most of the chansons he wrote incorporated the ideas of musique mesurée à l'antique, the musical analogue to the poetic movement in which poets tried to write French poetry using Latin meter (quite unnatural for French). Probably Le Jeune's most famous sacred work is his Dodécacorde, a series of twelve psalm settings which he published in La Rochelle in 1598. Each of the psalms is set in a different one of the twelve modes as given by Zarlino. Some of his psalm settings are for large forces: for example he uses sixteen voices in his setting of Psalm 52. His last completed work, published in 1606, was a collection of thirty-six songs based on eight-line poems, divided into twelve groups, each of which contained three settings in each of the twelve modes. 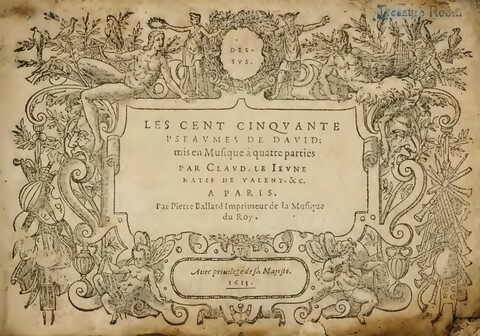 The work, Octonaires de la vanité et inconstances du monde, based on poems by the Calvinist preacher Antoine de Chandieu, was for groups of three or four voices. According to Le Jeune's sister Cecile, who wrote the introduction to the publication, he had intended to complete another set for more voices but died before finishing it.